Lori Hughes is a Youngstown State University Art Education graduate, who now resides in the Columbus, OH area. She started doing chalk art after visiting the 2005 Via Colori festival, in the Short North of Columbus, OH. Since then Lori has participated in chalk events from Ohio, New York, Minnesota, Georgia, Florida, and Canada. She also runs her own chalk festival in Alliance, OH where she grew up. 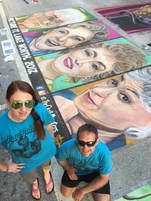 Her favorite types of chalk pieces to create are portraits, pop culture pieces, and Disney. When Lori is not chalking she is creating custom painted shoes. Lori teams up with Erik Greenawalt as “The Chalk Monsters,” and together they will be bringing their “A Game” to Chalktoberfest this year on one giant magical piece based on one little mouse.